Wow, I think I’ve finally gotten the hang of this blogging thing: 7 posts this month, updated wordpress to the latest version, wrote a headline directly from a blogging guide. Those professional bloggers all say that the headline is the most important thing about a blog post and nothing drives traffic more than “Top X Y things” -headlines. Professional blogging career here I come! The fine people of kokoromi just announced Gamma 3D. Gamma has now become this yearly awesome indie art game party held in Montreal as a part of the Montreal International Game Summit. This year’s theme is stereoscopy and they are calling for games that use stereoscopy as part of their gameplay, instead of just being a purely visual trick. It’s an interesting challenge. Last years theme was low resolution (256×256 was the maximum) and the results were surprisingly beautiful and inspiring. A lot of really good games came out the last year’s challenge: Mr. Heart Loves You Very Much, Passage and StdBits are the first to pop in to my mind. My entry was Bloody Zombies, which wasn’t exactly the most artistic entry of the bunch… So needless to say, I’m really looking forward to what will come out of this year’s Gamma. If you’re interested in participating the submission deadline is October 15th. And the Gamma3D party, with the selected games, beer and 3D glasses is taking place on November 19th. A while back I was watching this 1UP feature about Killzone 2 and I thought to myself that I should do a similar studio tour here at Kloonigames office (a.k.a. my apartment). It would have been this parody with these fake motion capture studio shots explaining how the physics of Crayon Physics Deluxe are being made. Stuff like that. Unfortunately the brilliant guys at LoadingReadyRun beat me to it with their Making of Geometry Wars video. Damn. I just finished playing though the first world (collected all the puzzle pieces), and I’m totally blown away by it (pun intended). My congrats to Jonathan Blow and David Hellman and everyone involved. You’ve created one beautiful game. Also I’d like to repeat what Chris Hecker said about the game. If you enjoy the game (which you will) spread the word. Tell your friends, blog about it, digg about it. 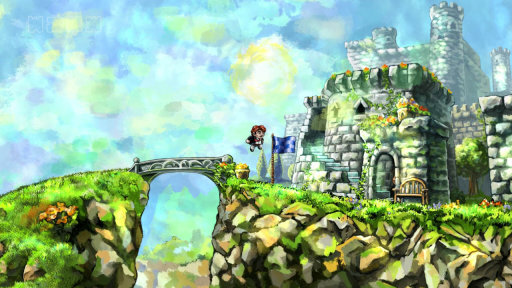 Independent games, like Braid, don’t have the marketing power that big studios have. They really need the word-of-mouth to be successful. And if there is any justice in this world, Braid should be a huge commercial success. Put your part in and make sure that Braid doesn’t end up being the Psychonauts of indie games. Jonathan Blow’s beautiful game Braid is finally available on the Xbox Live Arcade. If you’re an owner of Xbox 360 you should go buy it. Now. Seriously. It’s the best game I’ve played in years. I’m predicting that the Internets will go nuts about this game. I know that I went nuts after playing the game. The game made me realize that I didn’t know anything about game design and after playing the game I got some what depressed because of it. So if you’re an aspiring game designer and you think you know something about game design, don’t play this game. You will get depressed, sad and fan boyish towards Jonathan. You are currently browsing the Kloonigames weblog archives for August, 2008.